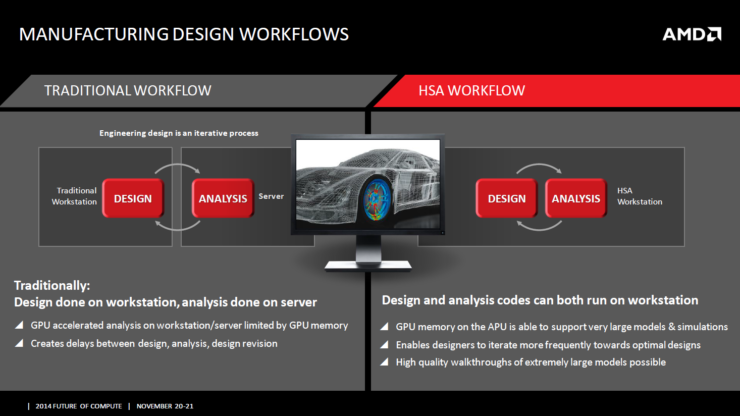 HSA, is something that is a bit difficult to explain, but simply put it is the unification of the CPU and GPU with both processors sharing memory, bus and scheduling among other things. AMD’s APUs are examples of HSA based processors (one of the major differences between Intel CPUs with iGPUs and AMD APUs by the way). However, the major problem that currently exists is that while HSA is a step forward in the right direction, the ecosystem of the same is severely lacking. There is an almost complete lack of HSA compatible software on the (commercial) market and HSA hardware is mostly made in the low-mid end segment. Take for example the AMD A10-7850K or Kaveri APU, which on HSA enabled work loads actually beats out the Intel i5 4670k (HSA benchmarks). 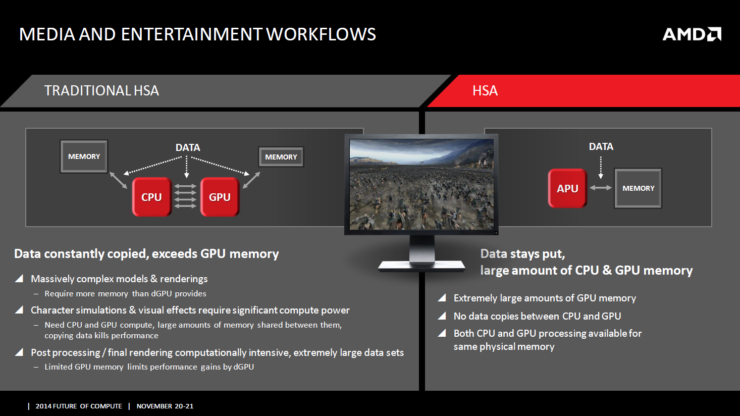 Which is nothing short of amazing, considering that steamroller doesn’t compare at all to Intel Haswell in terms of architectural power; that ladies and gents is the power of HSA right there. 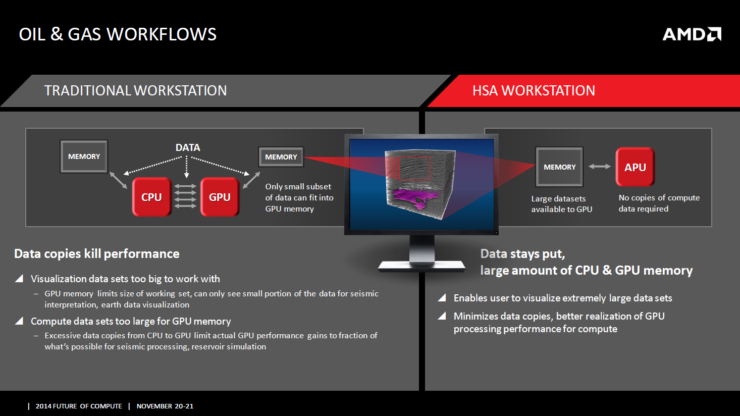 AMD’s talk about HSA in the Future of Compute Event primarily explains how it can be used to merge three different workstation types into one single station. The three types that are mentioned (quoting marketing buzzwords here) are Acquire, Simulate and Render. Basically, the Acquire type means a workstation for storing and accessing vast amounts of raw data. 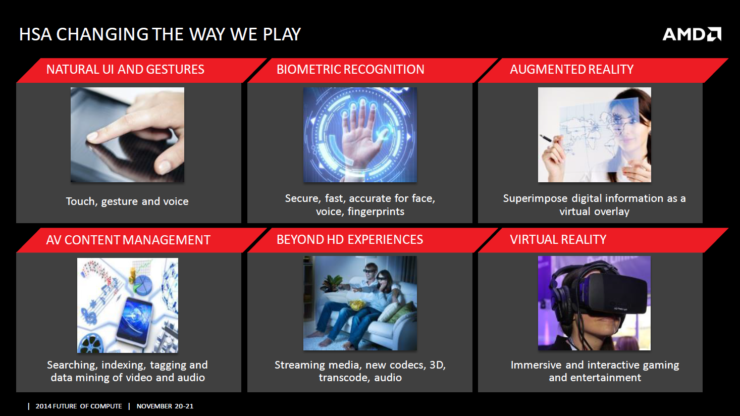 Since they are talking about 4k and 8k RAW video, it basically means that in such computers, you have configurations designed for quick access and storage (SSD-HDD combinations). For Simulations you usually have TESLA enabled workstations coupled with RAID configurations and finally for rendering you usually go with a render farm (for CPU rendering) or Nvidia Quadro/FirePro setup for GPU rendering. 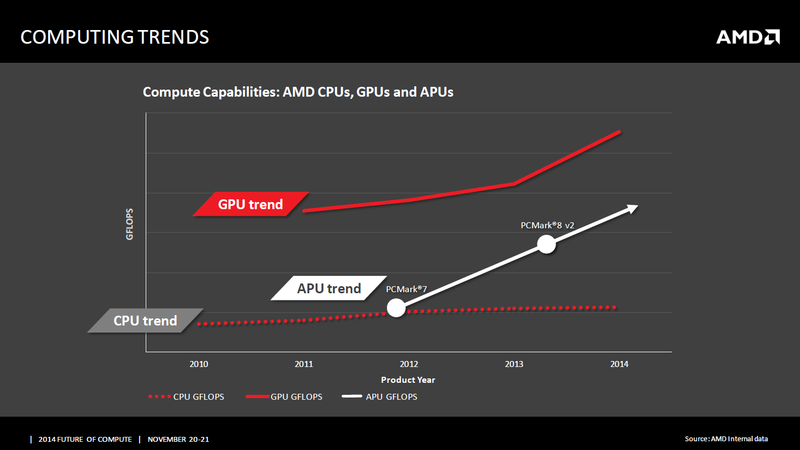 The reason for splitting is because these desktops are optimized for their own specific purpose which varies from high accuracy to double precision performance to high io etc. 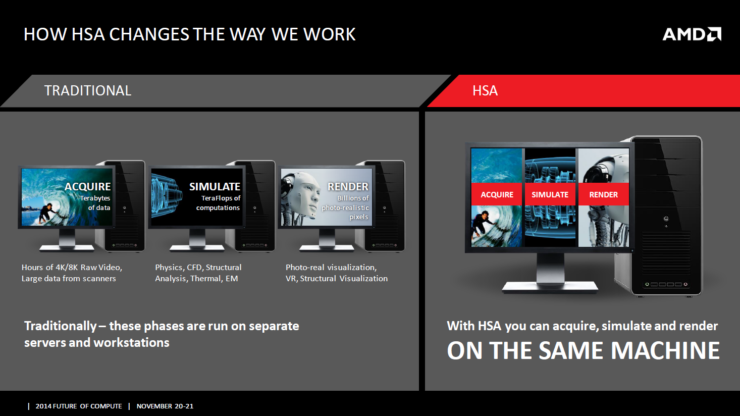 With HSA, the unified processor can do nearly everything that these tasks require. 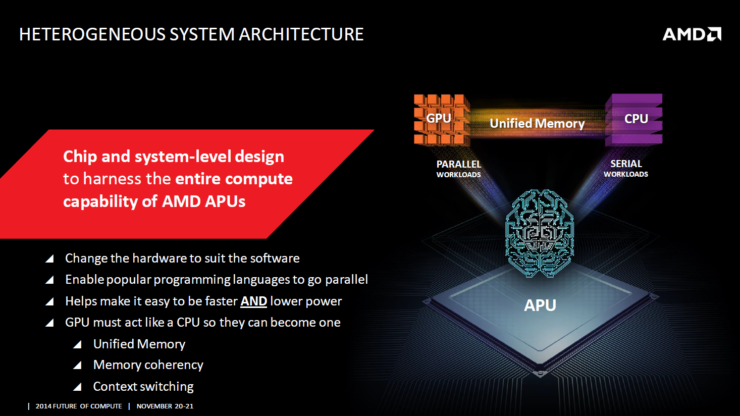 With the GPU handling parallel tasks and the CPU handling serial tasks with a unified architecture in place, it’s almost processor nirvana. 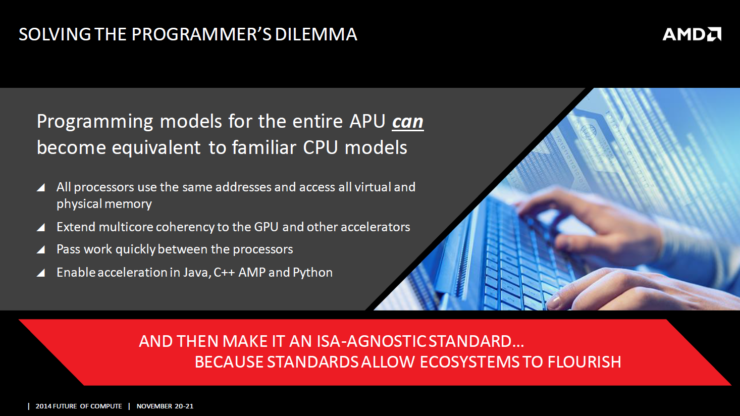 Another very big advantage of HSA is the fact that even though CPU technology has slowed down to a very stagnant pace, the fact that the unified processor has a GPU inside it means that its growth curve will be exponentially bigger than a CPU. Once again, something very desirable for the compute market. Now only if we had an actual ecosystem in place, we could get some proper progress.